Discussion in 'Guitars in General' started by dougdnh, May 16, 2008. I'm looking for a versatile archtop that can handle blues, rock, jazz, whatever. Since I live in a rural area, it's hard for me to try out a lot of instruments. 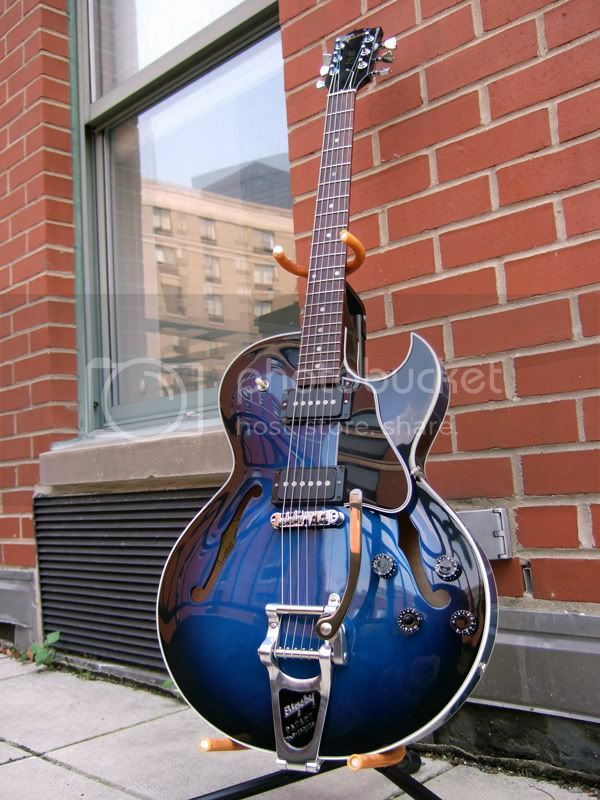 Has anyone ever compared a Gibson es135 to a Guild Starfire II or III? I realize that the 135 has a solid block, does that make it sound a lot different than the full hollow Starfire? I currently have a '70's es175 in my collection, but it just doesn't float my boat. Interesting question! 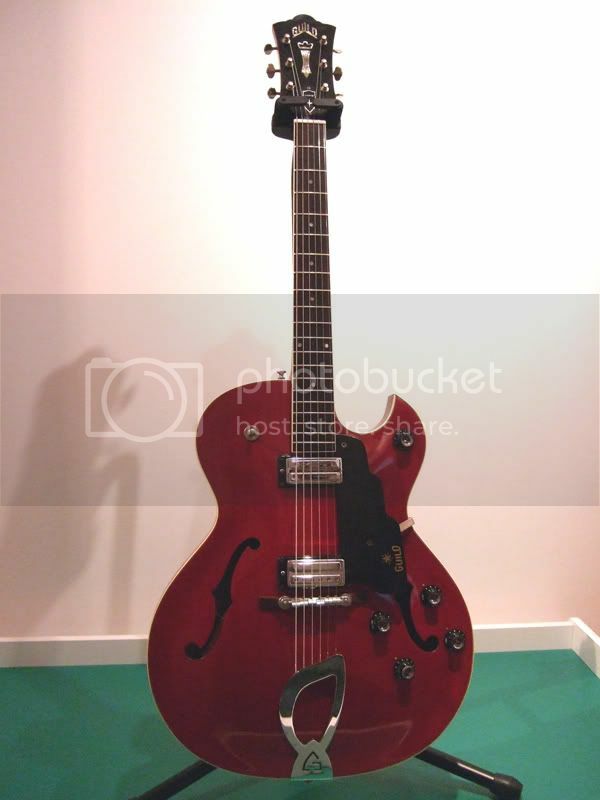 I did once compare a Gibson ES-135 (2 x '57 Classic pups) with a DeArmond Starfire (2 DeArmond Goldtone pups). I thought the 135 sounded better. I have never had the opportunity to play an American Guild. I've had experience with all three you mention here. Bigsby bridge, vintage-style Grover Stat-Tites. Nice guitar. unplugged and plugged into an amp. On the negative side, I didn't care for Guild's humbuckers at all. for me, so I sold it. the guitar felt / sounded right... the neck, the body, the fit, the nitro finish. all 100%. the pickups were underwhelming so I put in P-90's and never looked back. I have two now. They are outstanding guitars. The 1990's 135's are excellent guitars. The block gives you the sustain and gives you the right kind of feedback, etc. to the amp is really fun. can play it fairly loud without too much out of control howling. But it doesn't sustain exactly like the 135 naturally. blues / rockabilly / country swing sound and these guitars do it all well. with 57's humbuckers would do the trick. Gretsch archtops, etc. I don't miss any of them. The only other guitar I often jones for would be an ES-125TDC or ES-225TD. And I don't think that's gonna happen any time $oon. And ended up with this, just a killer axe. This baby moves me. Something about a thinline hollowbody - woody airy, seems to get that almost acoustic pure tone across electronically somehow, and yet gets a nasty feedbacky grind going when pushed. Some days I think about putting a Bigsby on it to make it like a III, but then why fool with mojo? To be honest I'm not much of a warble bar user anyhow, I just use left handed finger vibrato. Long winded answer, but there you go. I think more than Gibson Vs. Guild, it was semihollow versus hollow - and thinline hollow, I felt the fullsize hollows were too "rounded" sounding if that makes sense. A great second opinion there and nice guitars Jahn! later 1997 model. The '97 is way more solid / dense sounding. OP: If you go for a Guild, definitely try a vintage one. adding one to my 135... reminds me of a Gretsch. Oh yeah, Hans Moust, Guild guru, brought that up and said the Master Volume on this SFII was definitely a special order and probably the only one in existence that came from the factory that way, at least that he's seen (and he's seen plenty, heh). It's extremely convenient and has a great sweep to it. Believe it or not, that little extra option jacked up the price doublefold on a typical 60's Starfire when it sold from Rudy's Music Stop last year, I was lucky to grab it in an even trade for a 70's P-bass last fall. Nice score! So is that a mid-60's Starfire II? I have a closed top (no f hole) 135 and the block is mahogany. After bone nut, buzz feiten, and a few other details it is pretty good. The all blues, misty, mr 135, spooky, GTO, green dolphin, clips on my site were done with it..see link in my footer. It is a dark guitar which makes it sound bigger than it's size for jazz. I have kept 10's on it and use thumb & fingers for jazz. You have to cut lows and boost highs to get into 335 territory (like the mr 135 clip). Versatile guitar if you can find the no f hole one on ebay. Yep, a '66! Or a '65, I forget off the top of my head, heh.